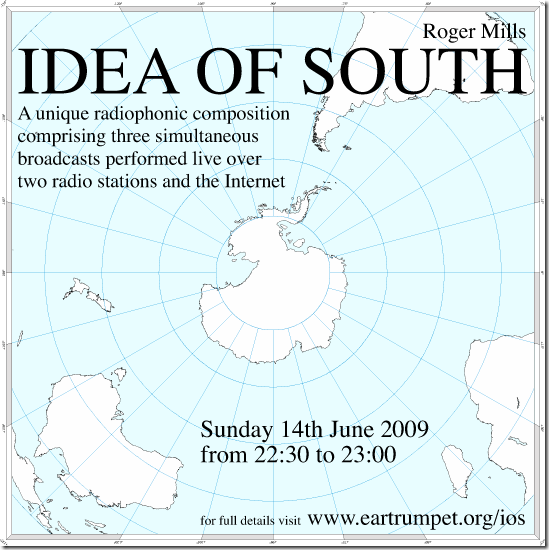 Idea of South – A unique radiophonic work by Roger Mills broadcast by 2SER and FBi radio in a dual station simulcast and accompanying internet stream. 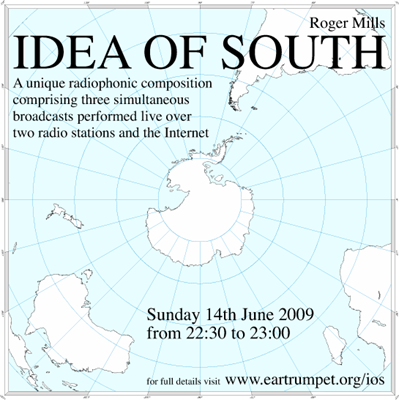 Composer and sound artist Roger Mills has produced an immersive new radio work, exploring the sound of the southern hemisphere as three individual parts to be listened to on two radios and an iPhone or computer. This has never been done before ! Simply tune your radios into 107.3 fm (Radio 2ser) an 94.5fm (FBi radio) and log onto the internet stream at www.eartrumpet.org/ios to listen to all three parts. Don’t have more that one radio or a computer ? Bring a radio down to Don’t Look Gallery, Dulwich Hill for a multi radiophonic experience as people tune their radios into a truly immersive sound environment. The evening starts at 18.00 and features DJ’s and a performance by Forenzics. 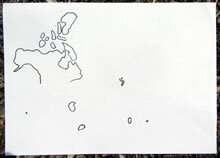 Roger Mills is composer and sound artist who has just returned to his native Australia after living in the UK for twenty years. In that time he wrote and produced albums with Statik Sound System (Cup of Tea Records) and remixed tracks for British electro rockers Kosheen. Other credits include his collaboration with Grantby on Mo Wax’s Headz 2 and Sydney’s DJ Soup on Creative Vibes ‘Evolutionary Vibes III’, featured as album of the week on Tripple J. His most recent work includes album projects for Turkish singer Mircan Kaya and British Jazz quintet Limbo featuring Jim Bar (Portishead).